I found these taking a walk (I was walking, not these thingees) which I thought might be called Wood Roses…but I looked it up and learned that Woodrose is “a parasitic plant endemic to New Zealand.” Since these fell from a pine tree in Berkeley, they’re definitely not woodrose, but they do look like Wood Roses! Previous Post: Speaking of Insanity…. I really enjoy your watercolor and ink sketches. 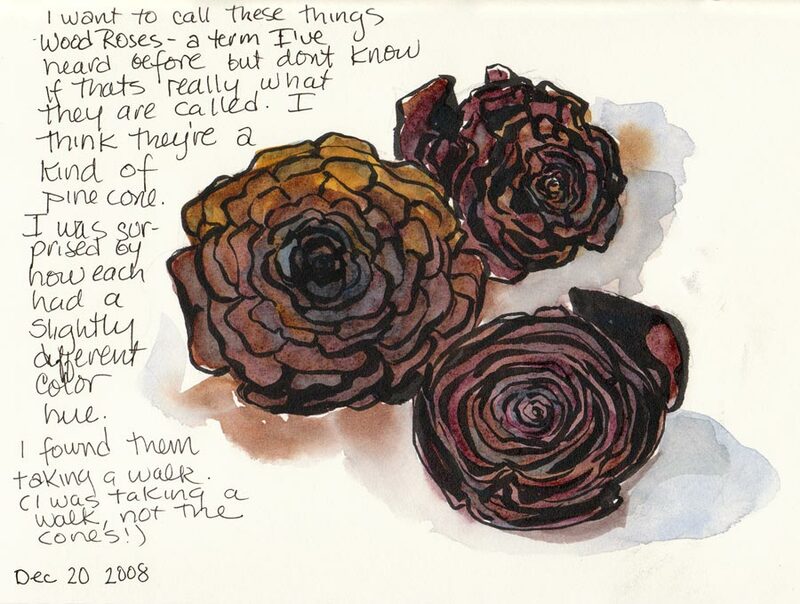 Definitely pine cones, but I love the imagry of ‘wood roses’ … so both!!! LOL Thanks for your note, Jana — and yes I know just how blessed we are to have mom and have her in such good health and spirits… I’m sorry your mom isn’t doing as well; such times are so painful in so many ways. My thoughts are with you and your mom … truly. I love seeing the progress you are making in your own artwork — oils, always watercolors .. and I hope you are striking that elusive balance been life and art … and that you’re doing well too! Miss you — and I hope your holidays are joy-filled! This is a besutiful watercolor. Love those great rich colors. And the shdows are lovely as well. I believe they are called Cedar Roses. We have a tree near my work. I pick them up when I find them. They are so pretty. Jana, I live outside of San Juan Bautista and there is a tree in town which has these cones. It is an Atlas Cedar and I did think these must be wood roses, but according to your info, they are not the real thing. I have a neighbor who’s from New Zealand and I forwarded him your painting and info and will see what he knows about wood roses! Love your work– never saw it till today, when my sister did the search for “wood roses”. I will sign up for your emails! Do you ever teach classes down this way? the wood roses you found are the top part of the Deodar Cedar tree pinecones,.. when the pinecone falls, since its made of many “petals” it falls apart leaving on the floor the very top of the pinecone that has the shape of the beautiful rose. If one is careful it wont break apart any further. i personally make floral arrangements with them for christmas,, you can dip them in melted wax not too hot not too cold and they will keep their shape,, ive heard people use other preservatives to hold it together. I like the wax because it absorbs into the woody petal and it brings out the darker shade of the and it shimmers aswell. I have the same cones here in Virginia. An expert told me it was a larch? Possible?